There are 178,371 photos on Flickr tagged “mustache” and 1,588 tagged “nose hair”. 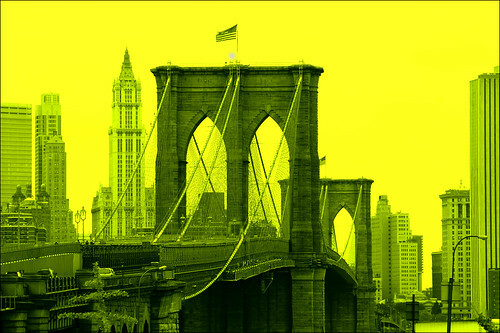 The Brooklyn Bridge is iconic. Almost everyone on the planet knows what it looks like. It’s right up there with the Eiffel Tower, Big Ben and the Pyramids. The challenge in photographing such a well known structure is finding a novel perspective, framing or juxtaposition. So you know the drill. Here’s a gallery with ten photographs which meet the challenge. And, as an extra added bonus free gift, here’s a link to a photostream of mainly New York photos (he has a photograph in the gallery, too). According to Oregon State Parks and Recreation, Haystack Rock is located approximately 1.5 miles (2.2 km) south of downtown Cannon Beach in Clatsop County, approximately 80 miles west of Portland. The nearest major road is U.S. Route 101. Haystack Rock is part of the Tolovana Beach State Recreation Site and is managed by Oregon Parks and Recreation below the mean high water (MHW) level, and above the MHW level by the Oregon Islands National Wildlife Refuge of the United States Fish and Wildlife Service. In this gallery I’ve collected eleven different views of the rock. Light, distance, point of view, time of day, color or black and white, sky, time of year, choice of lens, aperture and shutter speed, make each image unique. Each photographer brings a distinct way of seeing. In a prior post I wrote about the nature of photographic art. While Haystack Rock is certainly an interesting subject, what makes the images in the gallery art is what each photographer adds to the subject. Haystack Rock draws your eye but it is the overall effect, the setting and framing each artist chooses for the subject, which pleases the viewer and makes the photo memorable. Perhaps the most outstanding photographer of Haystack Rock is Arnold Pouteau. Here is a set of his images of the Oregon coast including 21 shots of the Rock. I’ve featured Pouteau’s work before, but it is superb and worth coming back to time and time again. I am not a religious person. At all. Which, of course, explains my fondness for the architecture of places of worship. When I saw my first English gothic cathedral I fell in love with the majestic design of the massive structure and its magnificent open interior. 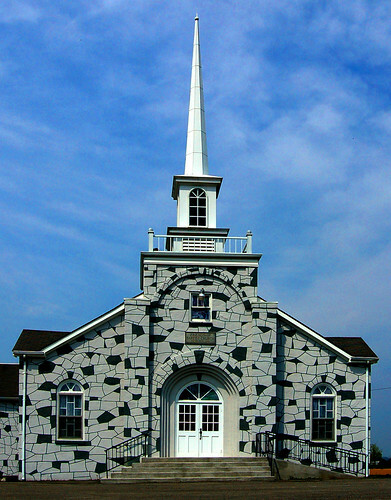 But even simple country churches appeal to me with their white, wooden exteriors, simple steeples and rough hewn pews. At the beginning of that tumultuous decade of the 1960’s my family moved from east Tennessee to Del Mar, California, a town about ten or so miles north of San Diego. I was twelve. My father, a veteran of the Manhattan Project, had taken a job with a company called General Atomics near San Diego. Del Mar was a beach town snuggling up to the Pacific on the west and into the dry foothills on the east. I liked it there. After adjusting to the much quicker tempo of life than had existed in my native Tennessee and making friends at junior high school, I wanted to be cool so I took up surfing. In the mild California Winters we would rent a house right on the beach (in the Summer the popularity of the Del Mar racetrack drove beachfront rental rates to Hollywood heights). At high tide, after a storm, the surf would claw itself to within a few feet of our front door and the chilly spray would noisily tattoo our seaside windows. I could grab my surfboard from the garage and be paddling out through the surf in a matter of minutes. Those days spent sitting on my battered old balsa surfboard (all I could afford) in my black wetsuit top, gently rocking on the glassy pale blue sea with my friends were glorious. I’d wait impatiently for just the right wave, paddle furiously and then, if my timing was right and nobody was on the same wave too close to me, accelerate down the face of the gathering swell as I rose to my feet. Some days the waves were too stunted or too menacing to attempt. Other days every wave would either elude me or toss me quickly off my board. Now, of course, my memory claims every one of those days was sunny, every wave perfect, and every ride was long and joyful. I haven’t surfed since 1962; we moved back to Tennessee that year. In 1984, when I was 36, I tried to surf again for about half an hour when I and my soon to be wife took a trip to the Outer Banks. It proved to be a comedy of errors. Even in the timid, small surf I only managed to stand upright for a grand total of five seconds or less. Despite that wobbly legged folly, I am still in love with the sport and remain an avid fan. I’ll watch anything about surfing from the Endless Summer to Step Into Liquid to Beach Party. Here is a link to a series of surfing photographs by Brian Bielmann I stumbled across in the online edition of the New York Times. These mostly black and white images are jaw-droppingly stunning and beautiful in an otherworldly way. Those photos put me back in touch with that skinny, twelve year old boy lugging his surfboard toward the growling surf on a California day. This is the one hundredth post on Visions. With my post asking why certain less than stellar photos on Flickr had so many hits, I incurred the wrath of at least two people. The first demanded I delete the link to, and my pan of his photo (and later called me an “old man” and jealous of his hit count in a subsequent post). The second condemned me for claiming I had published books of my work because they were published, by me, with Blurb. Visit the Shameless Commerce section of this blog (buy a book while you’re there!) and you’ll see I make my use of Blurb, as Richard Nixon would say, perfectly clear). Insightful, educational, cleverly written, and eminently entertaining! One of the best blogs I’ve come across in a long while. I won’t hold it against you that you’re a card carrying ACLU member. Photography is a universal language of visual communication that transcends ideology (or, at least, should), and your blog is top-notch! Long live flickr! I couldn’t have said it better myself. Since it appears he may be, ahem, a conservative, I will honor him by immediately stopping all of my funding of ACORN. It rained all weekend (accounting for all the new posts here). 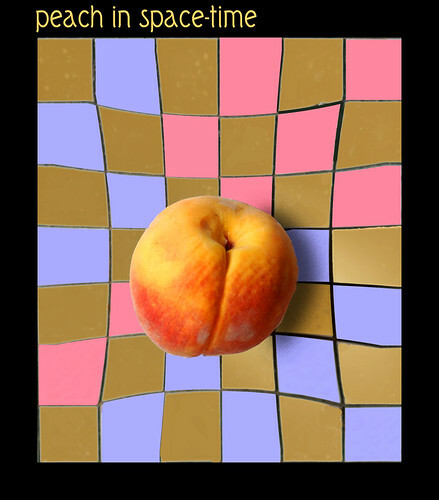 Below is a mostly photoshopped image made from a peach and a chessboard. Would Einstein Dare to Eat It? You are currently browsing the VISIONS blog archives for September, 2009.